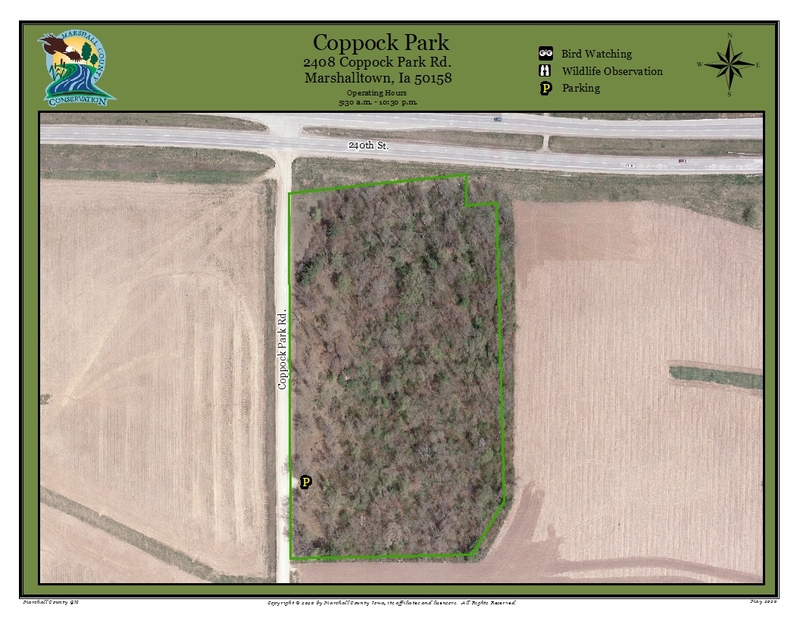 This 9.11 acres park was donated to Marshall County Conservation in 1964 by the Coppock family in memory of C.D. Coppock. Located on the old Highway 30 and now the new Highway 30 the park was originally utilized as a roadside park. As use of the park has lessened the area has been slowly returning to Oak timber. This parcel of land is ideal for mushroom hunting and wild flower viewing. Additionally the park provides a great resting location for warblers and other migrating birds in the spring and fall. Area consists of undeveloped natural area with oak forest. Wildlife Area Hours are 5:30 a.m. - 10:30 p.m. Open year round.